A router is a power tool designed to remove material from wood. Like drills, routers use cutting attachments called bits, although router bits and drill bits are not interchangeable. Routers are typically handheld, but they can be mounted in a router table to facilitate large jobs or repetitive work. Routers are available in relatively small sizes for home use, and in industrial versions for heavy-duty factory work. Routers for home use are available in plunge-cut and standard base types. Plunge-cut routers are designed to start their cut in at the surface of the wood, whereas standard routers are designed to operate on the edge of the wood. Many routers come with two bases so that a single router can be used for both purposes. A router table expands the usefulness of a handheld router by mounting it on a sold base. Routers can be either fixed speed or variable speed, and most sold for home use accept bits of 3/8 inch (smaller models) or 1/2 inch (larger models). A router is a high speed rotary cutting tool. It is most commonly used to cut grooves, create decorative trim along the edge of wood, or to hollow out areas. 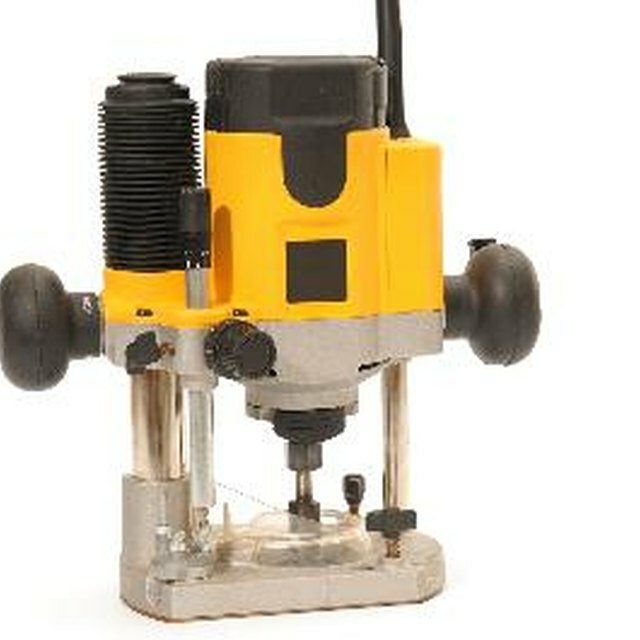 Unlike a drill, a router uses the edge of its cutting bit, which rotates at speeds of approximate 25,000 to 30,000 RPM to produce a smooth cut. Variable speed routers can typically be adjusted to rotate at speeds of 10,000 RPM to 30,000 RPM. Router bits come in various sizes and shapes depending on the hardness of wood or other material to be cut, and the type of cut desired. A router is one of the most useful tools in a woodworking collection due to its versatility, and in fact, many jobs can not be done properly without one, such as trimming laminate counter top for a custom installation. While many woodworkers and cabinetmakers use a dado head in a table saw to make grooves in a piece of flat stock, a router of acceptable quality costs no more than a high quality dado head attachment for a table saw. Exercise care when using a router on existing or recycled lumber, because nails and other fasteners hidden in the material could damage the bit or the router itself. Routers produce a great deal of sawdust, so plan to use your router in an area that can be easily cleaned. Although a router can be used for many different tasks, it is not always the best choice. When in doubt, ask your hardware sales professional if a router is the right tool for the job you wish to perform. Routers operate at extreme rotational speeds and the router bit is not shielded by a guard of any kind. Due to high rotational speeds, flying material and debris may be ejected with surprising force. Do not wear long sleeves or loose clothing while using a router, and wear safety glasses, goggles, or an appropriate face shield to guard against eye injury. Maintain a firm grip on the router at all times, because the tool can produce a surprising amount of torque. Read the manual and observe all safety warnings included on the packaging. Lowes: Is Any Tool More Versatile than a Router?